From the organisers of Octobers Movement Festival comes another sure fire techno winner Kappa Futur Music. This year once again took place in their famous skeleton esc warehouse that reaches far as the eye can see. The Italians always seem to know how to brand their soirees so well with their punchy and colourful artwork to their heavyweight line ups. Raw and authentic, the warehouse is like no other venue, based inside an old industrial park it was a perfect match for the music about to churn through the daunting sound system. 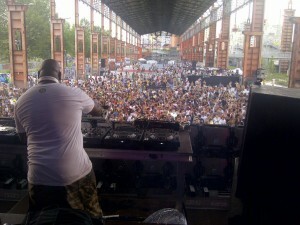 Big hitters like Carl Cox and Kerri Chander took the first day by storm in the their respected dwellings. Coxxy played the main stage to a warming audience. An unusual early set was not damped by the before mentioned comment as he donned his illustrious head bob and smashed out the stomping techno on his beloved fan faithful. Kerri on the other hand played a lot more deeper as you would expect and subtly married a mix of throbbing house with a blend of tougher cuts. Cadenza boss Luciano played a solid set and portrayed his special hand in the air whistle on everyone, by this time the crowd in a frenzy and loving every minute. Completing day one was Apollinia who after a slight hitch with the mixer where probably the highlight of the day for me. The French trio of Dan Ghenacia, Shonky and Dyed Soundorom leaked some fresh edits to the crowd whilst adding in some older more mature slabs. With both days having an equal mash up of boys and girls, old and new, day two was something even more special. 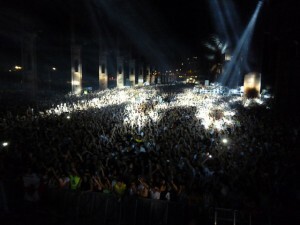 Marco Carola also performed an unusual early set, this time the native audience even more busier than Coxxy. He covered plenty of tech house bombs and drops that were a perfect set up for the night in tow. Ellen Allien added her take on proceedings with a slender deep set, then Richie Hawtin finished things off a crazy light filled epic. The Minus legend waved a set of moody and dark techno which was perfect as the sun blessed arena was now dark. All in all a truly exciting, none to expensive festival that is well worth a punt when planning your 2014, if you can’t wait that long then look into Movement this coming October.